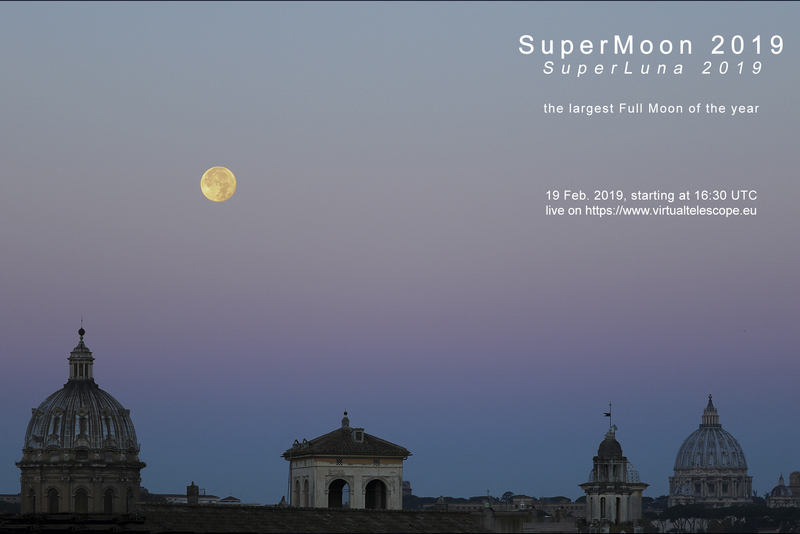 Next 19 Feb. the SuperMoon will be back. We will have the largest full Moon of 2019, the year celebrating the 50th Anniversary from the Apollo 11 landing on the Moon. At Virtual Telescope we will show it live, online, while the Moon will rise above the legendary skyline of Rome. Join us from the comfort of your home. Join our free, live webcast: you just need a computer/tablet/smartphone and a internet connection. We will admire our satellite rising above the breathtaking skyline of Rome, the Eternal City. It will be an unforgettable experience. Enjoy the largest SuperMoon of the year with us! The online, free session is scheduled for 19 Feb. 2019, starting at 16:30 UT. Waiting for asteroid 2012 DA14 close encounter next Feb.